The Farmers' Markets are in abundance, and we have a lot of zucchini, squash, carrots, eggplant, peppers, and onions to get through! Tomorrow's Friday and if you're looking to eat in, spend just 15 minutes preparing your family's side dish tonight and you'll come home tomorrow and be able to kick up your feet without any dinner worries. 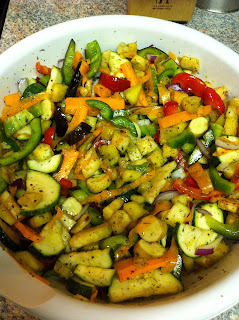 Here is the roasted vegetable recipe I prepared a few weeks ago. It's full of flavor without any added salt and it's tailored to what you and your family like. and red, green, and purple peppers. Any and all veggies you and your family love! 1. 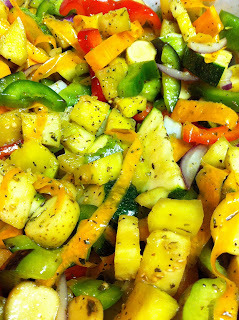 Cut all veggies into 1/2-inch or 1-inch cubes, julienne-style, etc. If you're using carrots, zucchini, or other oblong vegetables, sometimes I like to chop them into 1/4-inch thick circles, while also slivering off some slices with a peeler to add some character to the side dish. 2. 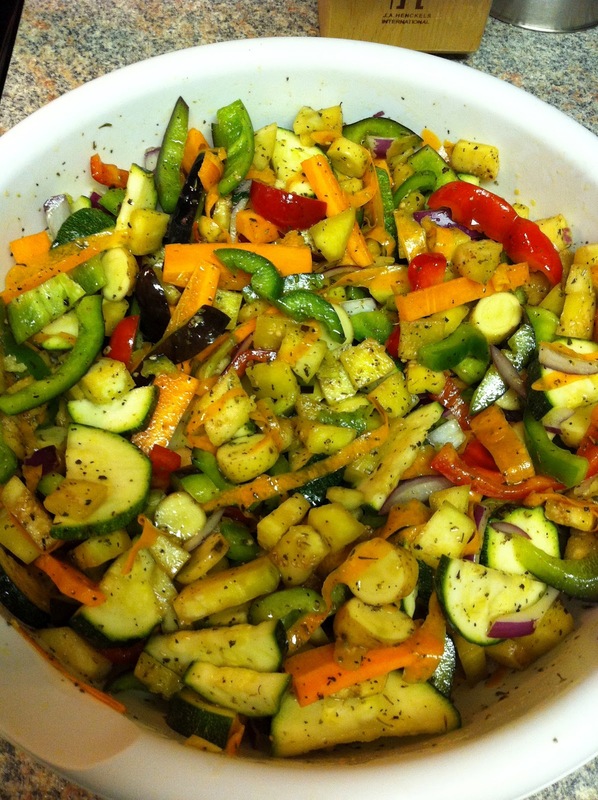 If you're preparing for a large family or with multiple vegetables, I recommend mixing the vegetables in a large bowl. If this is a smaller-sized recipe that you're making, a gallon-sized, resealable plastic bag can work to mix and store your vegetables. 3. In a bowl or plastic bag, add all of your chopped vegetables. Add 1 tablespoon of olive oil at a time and mix until all of the vegetables are evenly coated (this amount of olive oil will vary depending on your recipe size). 4. Add 1 teaspoon dried basil, 1 teaspoon dried oregano, and 1/2 teaspoon dried rosemary for every 1 cup of chopped vegetables as well. Mix thoroughly. For the greatest amount of flavor, cover your recipe or seal your bag and let it sit overnight (up to 2 nights) to let it marinate. Now your prep time is over! 5. When you're ready to cook, preheat the oven to 400 degrees F. Spray a sheet pan or casserole dish with non-stick cooking spray. Add the vegetables to the pan. The vegetables do not have to be in a single layer, but instead can be layered if you do not have enough room (they will still roast well). Roast for 35-40 minutes, or until vegetables are cooked to your liking. If you would like to add fresh herbs, add a few leaves of basil or sprigs of rosemary during the last 5-10 minutes of cooking. 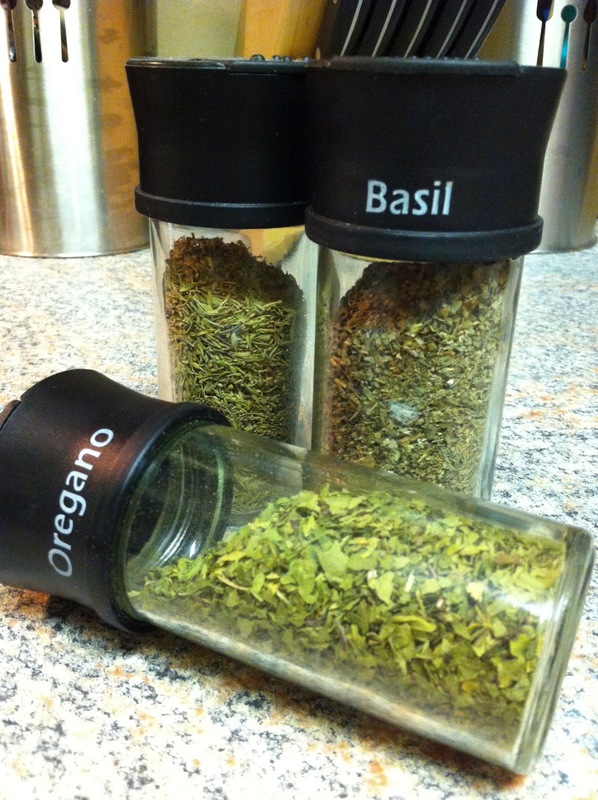 For a stronger flavor, add additional basil, oregano, and rosemary to taste just prior to serving. Serve with fish, pork, or chicken dishes, or by itself as a fiber-filled vegetable meal by sprinkling with asiago or parmesan cheese and serving over whole-grain rice or Israeli couscous. Let me know how you like it and I'd love to hear your own twists on the recipe.